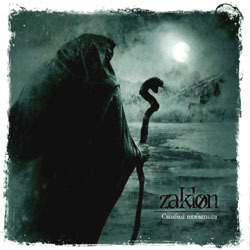 Zaklon return with their third full-length album “Сымбалі Нязбытнага“. This Belarusian band was formed in 1999 by Temnarod, who is their only member since then, composing and performing all instruments and vocals. After 4 demos the band released its debut full-length “Услед Змёрзламу Сонцу” in 2010. Next year “Шэпт Чорнага Лісьця” was out via Temnarod’s own label Forestland Productions and re-released by Gardarika Musikk in 2012. His newest work “Сымбалі Нязбытнага” was ready since 2012, but it was officially released with different artwork by Gardarika Musikk in 25th of February 2013. Following the path carved on their previous releases, Zaklon continue with their melancholic cold black metal. This time the album has a more straightforward approach, with less “atmospheric” elements. Their production is definitely improved, with a more solid and powerful sound, retaining still the band’s raw underground aesthetic. “Сымбалі Нязбытнага” sounds more aggressive, violent and uncompromising than its predecessors, remaining melodic at the same time. Its 8 compositions move between mid and fast tempo rhythms and they last totally for a little over 58 minutes. Guitars are again dominating their music with their melodic dark riffs, while drums sound much more natural this time. Their synths are discreet and mostly in the background, with only few exceptions of lead keys that add a folk pagan color in a couple of songs. Temnarod’s vocals are extreme black metal screams with a “venomous” bitter mood, in perfect harmony with their frozen music… All lyrics are in Belarusian again and for those who are interested they are included in the CD. “Сымбалі Нязбытнага” is for sure the most mature and solid work of Zaklon, recommended to fans of aggressive, yet melodic underground black metal. It’s not as “diverse” and atmospheric as their previous works, but it still has the characteristic sound of the band. It is released by Gardarika Musikk in a wonderful digifile edition, including a 2-page insert with the lyrics. The amazing artwork and layout design is by Al.Ex (mayhem project), who was also the artist of their previous album. Since there aren’t any official pages for Zaklon, you better visit their label’s site for any details about this release.